My four children have all been active in high school and year round sports teams. Taylor, as many of you know, was a Division I distance swimmer in college. My youngest son, currently a high school Senior, will play Division I lacrosse in college. These facts mean that I am an expert by default in three things: distance highway driving, bulk laundry, and making supper. I will confess that the steaming suppers borne out of casseroles, crock pots and stew pots were probably lacking in the looks department, but they were really, really tasty! I would affectionately call my weeknight culinary high art, “ugly but good”. Taylor is still bugging me about the recipe for crock pot Caribbean Chicken ( chicken breasts, jerk sauce, cream cheese and peach jam…you get the picture). This said, not all things crazy tasty have to be low-brow in the looks department. Chipotle Sausage Bacon Pinwheels are make ahead, pert, pretty, meaty, spicy and delicious! Soft yeast dough is made ahead and kept chilled until you are ready to assemble the pinwheels. The roll dough is spread with Tabasco Chipotle Pepper Sauce cream, cooked bacon, sausage and chopped scallions. The rolls are brushed with Tabasco Sweet and Spicy Pepper Sauce butter. Bake them free form or nestle them in round disposable aluminum pans. If you wish, freeze some or all of the rolls and thaw and bake at a later date. Chipotle Sausage Bacon Pinwheels make a great grab and go tailgate breakfast. Or, serve them on a platter as a buffet brunch selection. The rolls are hearty and stand up well to tailgate soups and stews. 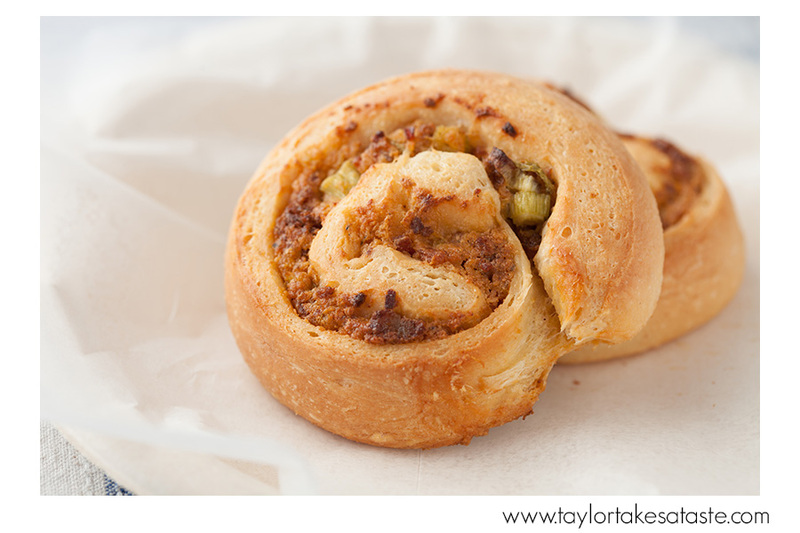 Bring some whimsy to your next tailgate or gathering and make Chipotle Sausage Bacon Pinwheels. 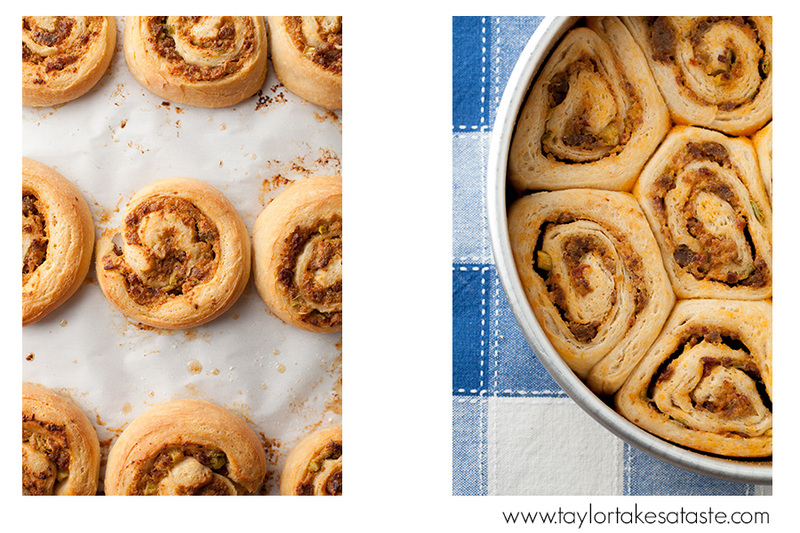 These piggy pinwheels look like cinnamon rolls and taste like hog heaven! Make the pinwheel roll dough. Into the work bowl of a stand mixer fitted with the dough hook attachment add the flours. In a saucepan over medium heat, warm the milk, 4 Tablespoons butter, 1 1/2 teaspoons kosher salt and 1Tablespoon plus 2 teaspoons of sugar until the butter is melted. Stir. Remove the pan from the heat and let the milk mixture cool until lukewarm. In a small bowl add the yeast, remaining 1 teaspoon sugar and 1/4 cup water. Stir to mix and set mixture aside. Turn the mixer speed to low. Add the lukewarm milk and yeast mixtures. When the flour and liquids are mixed, raise the speed to medium and beat the dough for 8 to 10 minutes, or until the dough forms a ball and clears the sides of the mixer. Remove the dough from the mixer and put into a large buttered bowl. Cover with a clean dish towel. Let the dough rise until doubled in bulk. Punch the dough down and put the dough into a large, sealable plastic storage bag. Refrigerate for up to 3 days or freeze and thaw before making the pinwheels. To make the Chipotle Cream Filling, cook the sausage in a nonstick sauté pan over medium heat until browned and crumbly. Drain the sausage on a layer of paper towels. Empty the sausage grease from the sauté pan and set pan aside. Fry or bake the bacon and drain the bacon on a layer of paper towels. In the sauté pan add the onions, peppers, celery and garlic. Cook over medium heat, stirring frequently until the onions are translucent, about 10 minutes. Remove the pan from the heat and set aside. In the work bowl of a food processor, add the cream cheese, onion and pepper mixture, parmesan, Tabasco Chipotle Pepper Sauce, Tabasco Sweet and Spicy Pepper Sauce, salt, pepper and thyme. Process the ingredients until they are will mixed. Crumble the cooked bacon and add to the processor. Pulse the processor until the bacon and chipotle cream are just mixed. Set aside. Preheat the oven to 375 degrees. Mix 2 Tablespoons Tabasco Sweet and Spicy Pepper Sauce into the melted butter. Brush the tops of the pinwheel dough with the Sweet and Spicy Melted Butter. Let the rolls rise until doubled in bulk. Bake the pinwheels 18 to 22 minutes or until they are light golden brown. Remove the pinwheels from the oven and cool on/ in their pans. Serve or freeze until needed.